After Tuesday's election, I did my typical copy and paste job on the precinct-level data and came up with a handful of lessons on local Thurston County politics. I talked about these maps in the latest episode of The Olympia Standard. But because visuals like maps don't play well over the podcast, I'm putting them up here. Here are all the spreadsheets and map I've been working from. The data is from only a day or two after the election, so as counts march on, things will change obviously. But in terms of making maps, I think these will more or less stand pat. For further reference, Adam Peterson did some really great shapefile based maps that he posted to Thurston Progressives. Back in August, after some concern that the progressive candidates really wouldn't have a good time in November, I predicted that "power elite" candidates like Allen Miller and Jeanine Roe (and likely Max Brown) wouldn't be able to break out of their friendly SE Olympia neighborhoods to find a majority in November. By "power elite," I'm borrowing a phrase coined by Steve Salmi over at Green Pages when he described the August results. And, this happened because most of the places were Miller in particular picked up better percentages in November were places he already did well, as illustrated by this map. 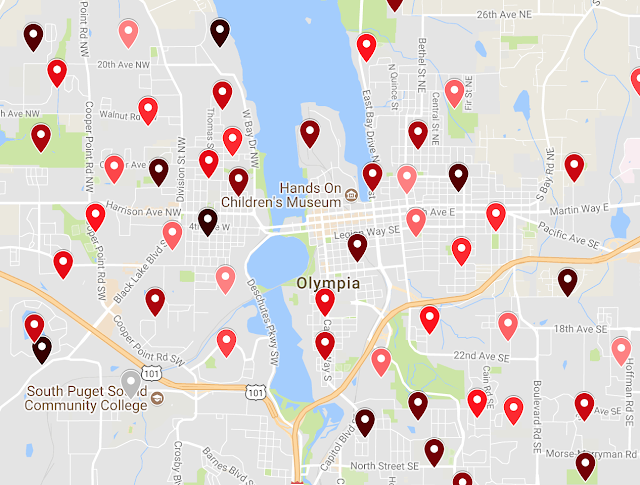 Miller picked up more votes along the edges of town, places similar and including his SE Olympia power base. He lost support as a percentage throughout most of Olympia, towards the center of town in older, more walkable neighborhoods. Compared to Brown and Miller, Jeanine Roe did better, but still not well enough to keep her seat. This map shows where she did better than Miller and Brown, which was slightly further in than the edge of town, making second ring neighborhoods more competitive.